Over the past few years, whenever I would hear someone making fun of Bollywood movies, the usual Indian stereotypes about them being campy, cheesy musicals using technology that was backdated to the 1960’s, this is the film I would “Rick Roll” them with, showing them one of these two songs. Normally, an uncomfortable silence would follow and they would awkwardly move onto another topic, without a word about what I showed them. For some that might not seem like an accomplishment or as if anything significant had transpired, but the silence these two videos were met with from people who would normally say something to shut me down or rudely blow it off. That they had nothing to say, says a lot. While they may have not said that their previous comments were wrong (these are not the sort of people to apologize), but the fact that they didn’t try to fight or defend their comments either shows the effect of what a four minute video can have. 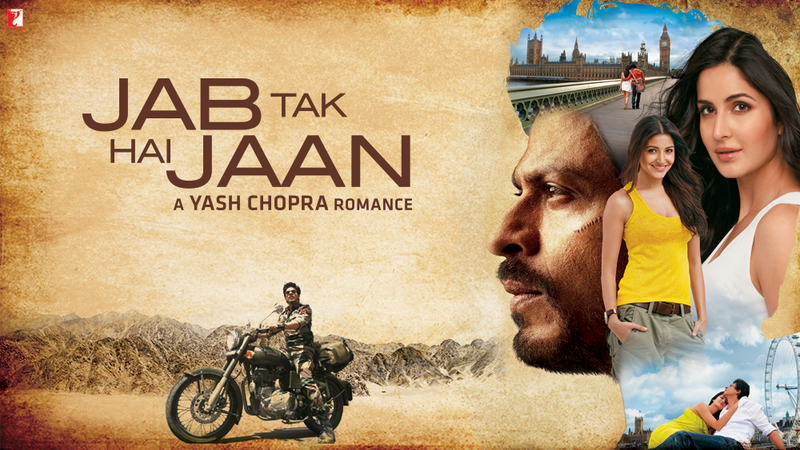 And while “Jab Tak Hai Jaan”, may not be considered director Yash Chopra’s best film, (though it was his final film before passing), the impact it had on people I showed it to demonstrates the power of film and the media influencing opinion. And I think most importantly, that this is a Bollywood made film, not a Hollywood one making this impact. And its impact can be seen elsewhere too, such as through the internet. I found out about “Jab Tak Hai Jaan” through a cover collaboration of “Jai Ho” done by Peter Hollands and Alaa Wardi, whose YouTube channel I visited and listened to his cover of “Jiya Re” and then sought out “Jab Tak Hai Jaan” from there.